In the spirit of Thanksgiving, CreativeMornings and Coffee & Design are coming together to host a talk from 5 Points, a local arts and design collective. Led by KC creatives John Dawbarn and Steve King, 5 POINTS is a pop-up experience that is reinventing the way we think about work and creative work, in particular. 5 POINTS appears for a limited time wherever creative people are, selling one-of-a-kind designer goods and hosting hands-on workshops. Most recently, the concept made its home in Venice Beach and, before that, in San Francisco. 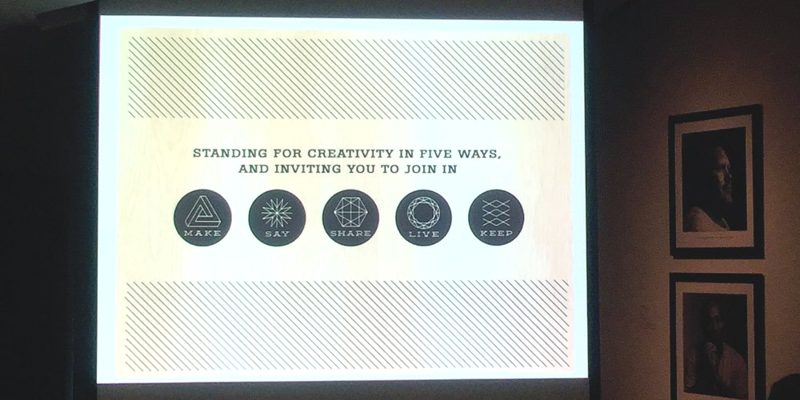 5 POINTS lives by the tenets: MAKE, SAY, SHARE, LIVE and KEEP, which they say are five different ways to be creative. They believe that a successful pop-up space offers ways to build things on the spot (MAKE), express who you are (SAY), connect with like minds and spirits (SHARE), help create a better world (LIVE) and hold onto those memories afterwards (KEEP). The pop-up concept keeps all of its events buzzing with in-the-moment activities, including murals where visitors are encouraged to roll up their sleeves and add their own personal touches. Lately, the collective has been working with a 3-D printer and laser, enabling customers to see products come together in real time.